Conversational AI is the next user interface paradigm in computing, making human and computer interactions more natural. We’ve evolved from a world where humans have to learn and adapt to computers to one where computers are learning how to understand and interact with humans. Conversational AI allows people to interact with computers in a natural manner including speech, graphics (cards), or text, and enables computers to learn and adapt to better understand us. Microsoft offers both Azure Bot Service and Microsoft Bot Framework to help develop such conversational experiences into your applications. Azure Bot Service, Generally Available as of Dec 2017, provides a robust solution for connecting your Conversational AI to audiences on public channels like Microsoft Teams, Skype, Cortana, Facebook, and the web along with custom experiences in apps and on devices. The Azure Bot Service is SOC 1, SOC 2 and SOC 3 compliant, adding to the existing ISO 27001, 27018, PCI (DSS) and HIPAA/HITRUST compliance. You can get started building bots using Microsoft Bot Framework and Azure Bot Service. With Bot Framework V4, you can quickly start with a simple bot design and increase its sophistication and intelligence by adding different Azure Cognitive Services such as Language Understanding (LUIS) models and QnAMaker knowledge bases. With LUIS, you can add natural language interactions to allow your users to interact with your bots more naturally and expressively. Your bot’s conversation can use plain text as well as more sophisticated cards containing text, images, and actions buttons. The V4 SDK comes with a robust set of templates, samples, and reference implementation to bootstrap the creation of conversational applications on Azure. These templates include best practices and patterns from working with numerous developers building conversational apps using Cognitive Services. Our templates enable developers to create a foundational bot experience that includes all required Azure dependencies. With these basics in place from the start, developers can focus on increasing the application’s sophistication and intelligence by adding different Azure Cognitive Services such as Language Understanding or QnAMaker knowledge bases, and allow customers to interact with your bots more naturally and expressively using speech, text as well as more sophisticated cards containing text, images, and actions buttons. The Bot Framework Emulator is an open-source, cross-platform application for Mac, Windows, and Linux that allows bot developers to test and debug their conversational application on their local machine or in the cloud. The Bot Framework Emulator includes features such as an improved dynamic layout model, ability to inspect responses from bot’s services such as LUIS and QnA and support for multiple bot configurations, and bot debugging based on transcript logs and transcript playback in presentation mode. The Bot Framework Emulator V4 simplifies integration and management of the different services that are part of a conversational experience. Developers can directly log into Azure and open and manage Cognitive Services including Language Understanding (LUIS) and QnAMaker that are part of their bot. Download the new preview version of the Bot Framework Emulator today as it supports bots from all Bot Framework SDK versions. With the rich toolset provided by Bot Framework V4, our customers can bootstrap conversational application language understanding and streamline language model generation. Both developers and product owners can take part in the conversational app authoring process and review overall conversational performance with rich logging and analytics. All Microsoft Bot Framework SDKs, Emulator, and command-line tools are available as Open Source projects on GitHub, have a vibrant community and support Mac, Windows and Linux. Our language understanding services are available on from our Language Understanding (LUIS), QnAMaker portals and Cognitive Services. Many customers spend time and effort building custom understanding for names, geographical locations, phone numbers and other domains. Today, the Language Understanding service (LUIS) is announcing better understanding capabilities including new built-in entity types for people names and geographic location. Language Understanding (LUIS) service has now also passed the audit for PCI, adding to the existing ISO 27001, 27018 and HIPAA certifications. 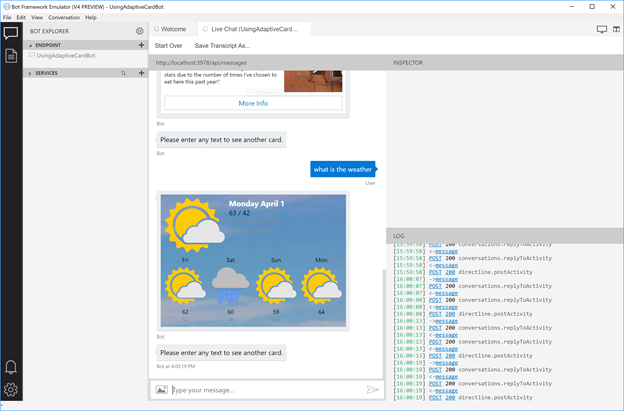 QnA Maker is an easy-to-use Azure Cognitive service to respond to users’ questions in a more natural, conversational way. Thanks to QnA Maker’s graphical interface service, you don’t need to have natural language understanding expertise or experience to leverage it. Using QnAMaker, developers can build, train, and publish question and answer bots in minutes. QnA Maker has built-in support with Bot Framework SDK V4 to enable smarter conversation for your bot. With this release, QnA Maker increases its ability to extract knowledge from semi-structured .doc and .pdf. QnA Maker will extract questions and answers pairs from such files and add them to your KB. With this release, QnA Maker has also added support for simple chit-chat experience. You can easily add a set of pre-defined chit-chat to any KB, and choose from 3 available personalities: The Professional, The Friend, and The Comic. You can further edit and customize the chit-chat data to suit your bot. Learn more about adding chit-chat to your QnA Maker service. QnA Maker has now also passed the audit for SOC and PCI, adding to the existing ISO 27001, 27018 compliance audits it has completed. Create a QnA Bot with Azure Bot Service and check out the updated QnAMaker portal. We have seen significant need from our customers and partners to deliver a conversational assistant tailored to their brand, personalized to their customers and made available across a broad range of conversational canvases and devices. Continuing Microsoft open-sourced approach toward Bot Framework SDK, the open source virtual assistant solution accelerator provides full control over the end user experience built on a set of foundational capabilities. Additionally, the experience can be infused with intelligence about the end-user and any device/ecosystem information for a truly integrated and intelligent experience. We strongly believe our customers should own and enrich their customer relationships and insights. Therefore, any virtual assistant provides complete control of the user experience to our customers and partners. The name, voice and personality can be changed to suit the organization’s needs. Our virtual assistant solution accelerator simplifies creation of your own assistant enabling you to get started in minutes. The scope of virtual assistant functionality is broad, typically offering end users a range of capabilities. To increase developer productivity and to enable a vibrant ecosystem of reusable conversational experiences, we are providing developers initial examples of reusable conversational skills. These skills can be added into the conversational application to light up a specific conversation experience, such as finding a point of interest, interacting with calendar, tasks, email and many other scenarios. Skills are fully customizable and consist of language models and code. At Ignite we are announcing an initial preview and working closely with initial customers and partners in an open-source repository to validate and make it available more broadly in the coming months. Check out the virtual assistant solution accelerator documentation for more information on getting started. 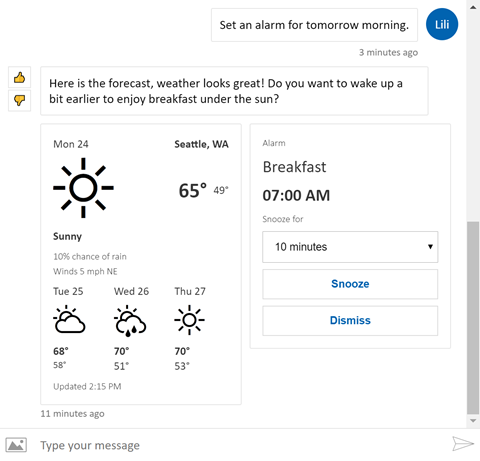 The Bot Framework Web Chat control is one of the popular conversational canvases with customers using the Azure Bot Service. The Web Chat control offers a quick way for developers to integrate their bots into existing websites. Based on feedback from the community and our customers, the V4 release of the Web Chat control allows developers to fully customize the chat window, including ability to change colors, padding, sizes, and to brand the canvas with custom graphics and logos. Even the placement of speech input and the order of messages can be controlled by the developer, and they can add a persistent menu button or introduce custom avatars. The new architecture includes enhanced authentication, persistent conversation history and can perform actions such as a transition to a different page, features and across multiple conversations. Additional updates include enhanced authentication features and persistent conversation history across multiple conversations. Learn more about the latest changes to Webchat. We have a number of customers such as Progressive, Dixons Carphone, UPS, Progressive and Adobe building AI apps and agents.